Out of the seasons, summer is painful because in India in the summer season, there is so much heat, and humidity are there which make the situation worse. Especially in some states, the summer is a real pain. We do every possible thing to beat the heat, and for that, we use Water Coolers, Air Conditioners, and fans. AC is the best for summers but not everyone can afford it as it is a costly product, and it consumes a lot of electric power as well which increases your electricity bill. So, people use coolers or some high-quality fans as well. Today we are going to talk about Pedestal Fan which is one of the best types of fan that gives a heavy blow of air. 1 What Exactly is a Pedestal Fan? 2 How to Select the Best High-Speed Pedestal in India? Buying Guide! 4 Tower Fan vs Pedestal Fan – Which is Better? 5 How to Assemble Pedestal Fan? 6 How to Clean Pedestal Fan? Recommended Reading - What is a Pedestal Fan? What Exactly is a Pedestal Fan? A Pedestal Fan is an electric oscillating fan supported by an adjustable stand. The stand’s height can be adjusted, and you can detach the stand as well. Pedestal fans may look similar to table fan, but they have bigger blades and better speed. Even for a large room, Pedestal fan is enough because of the heavy blow of air it provides. So, this buying guide is for those who are interested in Pedestal fans as we are going to discuss everything about it, and how you can choose the best pedestal fan for your house. Let’s first look at the factors that you should consider while buying a Pedestal Fan in India. How to Select the Best High-Speed Pedestal in India? Buying Guide! CMM stands for Cubic Meters per Minute. It is the ability of a fan, which converts the electrical energy into the moving air. Higher the CMM more air will move out. As the heat increases in summer, we need a heavy blow of air to feel relieved, and that is why you should consider CMM at the time of buying a Pedestal fan. The speed of a fan is measured in Rotation Per Minute (RPM). This literally means, how many times the fan wheel rotates per minute. In general, more the RPM, more air will be shot by the fan. Better speed can give a heavy blow of air in all the corners of the room. At times you might want a device which has the ability to be operated remotely. You might desire to just lay down on the couch and change the fan speed using a remote control. Though remotely operated fans are not so common in India, you can still look out for the fan that can be operated remotely. This allows you to change the speed, adjust the height, and other things just by using a remote while lying down in the bed. Another amazing feature which very few fans have is, you can set-up a timer after which, then the fan would automatically turn off. This is again not a very common feature, but it is good to consider this feature as well. If you get this feature in your favorite fan, that is nothing better than this as you can set the timer usually in the season when in the evening and at night there is hot weather but in the morning, the weather cools down. So, in such case, you can set the timer so that at the time when the temperature cools down, fans goes off. Finally, there are several other factors that one could observer, like Price & Warranty, make sure that your purchase is the best within your budget, and avoid shopping without warranties. Further, do consider the noise produced by the fan; a very noisy fan will not be suitable in quiet places like bedrooms. Noisy fans are distracting, and if you use the fan at night while you sleep, the noisy one won’t let you sleep well as well. Even if kids study, they can be distracted by the sound. Therefore, consider the noise factor while buying a Pedestal fan. We have talked about Pedestal Fans and the factors that you should consider while buying a Pedestal fan. Now, it is time to look at the best 5 Pedestal Fan in India which are handpicked by our editor to give you the best options to take the buying decision. This Usha Maxx Air pedestal fan is aerodynamically designed with semi-transparent PP blades and is one of the best-selling pedestal fans in India. Not just that, it is a fan high air delivery of up to 67 CMM. Its design and blades maximize the effectiveness of these air conditioners by generating a comfortable breeze, also enabling you to save energy by increasing thermostat temperature setting. The speed of the fan is 1280 RPM. It also has a unique oil reservoir lubrication for better durability and reliability. It also has a firm base which makes it sturdy. Thus, it is jerk-free and provides uniform oscillation. It is perfect for any part of your office or house, be it a bedroom, gallery or a garden. It comes with two color options- white and blue which absolutely suits the interiors of your office or home and gives an elegant look. Enables you to save energy by increasing thermostat temperature setting. No Remote, only manual mode. Q: Does it have 3 pin plug? A:No, it has 2 pin plug. Q: What is the speed of the fan in RPM? 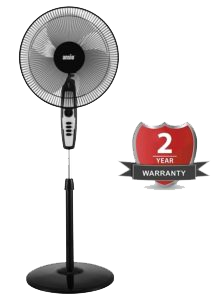 The Havells V3 Yurbo is one of the superior low voltage performance pedestal fans. 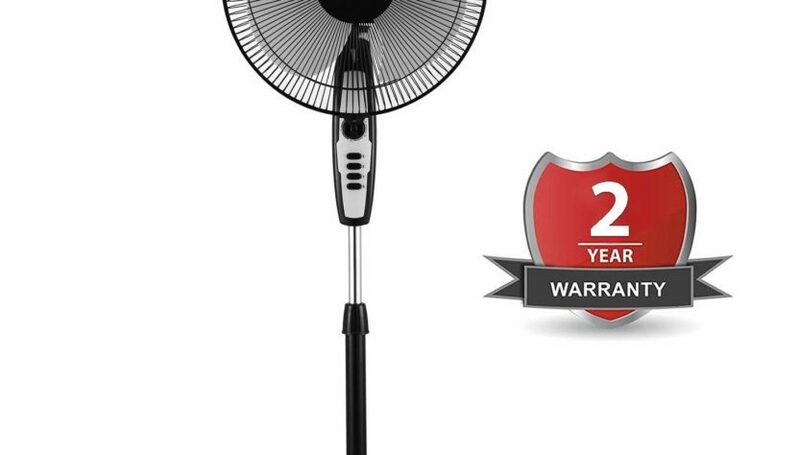 Like many other fans, this one also has a thermal overload protector (TOP) which helps in protecting the motor in the fan from any high voltage fluctuation. The speed of this pedestal fan is 1400 RPM. Its air delivery is 110 CMM. The fan is aerodynamically designed and has balanced blades. The fan does produce slight noise of around 62dB which can be ignored as that is due to its high speed. However, the Havells brand delivers the best durable and long lasting product. Gives excellent low voltage performance. Slight noise of around 62dB due to its high speed. Q: Is there an auto-swing facility? A: No, it doesn’t have. Q: Does the fan have wheels at the base? A: No, there are no wheels, and the fan is a little heavy as its blades and body are made of steel. The Indian weather needs a fan for a breezy feeling on your skin. In fact, the fan has been a universal option for a long time. Right from the pre- British era to the more modern versions, there are multiple versions of the fans, and all of them are in use with varying degrees. Let us check out the different fan types for a clear understanding of how do they work. These are the most common fan types and are ubiquitous by their presence. It works as a centrepiece for most the Indian homes. Now that it is used in the living room or any other rooms and are at the centre of the room attracting everyone’s attention. Of course, there is no dearth of different styles in a ceiling fan, but you should exercise caution in choosing a style that goes with your décor. While choosing the right ceiling fan, make sure you are giving a due consideration to the size or area of your room. They provide a circulatory breeze and thus makes your room feel much cooler. These are best suited for providing you access to the best ever cooling experience for larger rooms. They can be a perfect option to do outdoor events. In fact, the versatile functionality and ease of placing it anywhere ae the two features that make it a great choice. The pedestal fans come with an adjustable height and thus enhance the comfort level to a greater extent. Most of these fans come with an option for oscillation and can cover a wider area than that can be covered by the normal ceiling fans. They also come with a remote control mechanism or timers for better functionality. As the name itself should indicate, these fans can be an excellent option for cooling a particular area of the room. They are perhaps the most portable options ever. You can place them either on a table or on a floor, or on any surface with ease. What makes table fans one of the preferred choices is the fact that they can be used in any preferred direction you would want to. The swinging or oscillating feature that it provides you is yet another great option you would love with it. These are most compact and smaller and thus can be easily transported anywhere you want to. If you are looking for an economical cooling, the table fans beat almost all other fan types. You may prefer to check of some of the best table fans in India that we have listed. The tower fans can be a great option for cooling a wider and larger area. Some of the tower fans come with an additional functionality wherein they can assist you in purifying the air with the help of ionisers that come built within the fans. The fan comes with a thinner vertical design and thus can be a space saver to a better extent. If you are looking to opt for a fan for the smaller and compact areas, the tower fan can be a great option for your needs. However, they need to be used carefully as they are likely to be tipped over. One of the features that make them the best option is the quieter operation that they offer you. These fans can be compared to be the air conditioners as well. In fact, they are referred to as the primitive air conditioners and work with the evaporative cooling technology. These fans come with a high pressure pump that pushes water in the form of droplets. These droplets provide a complete zone of cooled air. The fans come with a specialised easy assembly options and offer you an excellent energy efficiency. The fan can be a great option for the backyards, patios and fields. The Crompton Hiflo pedestal fan has plastic blades which give it a modern look and makes it suitable for your interiors. Also, the body and base are made of plastic. The speed can be easily adjusted with the push buttons. The speed of the fan is 1300 RPM. The minimum air delivery is up to 70 CMM. It has quiet a wide oscillation without any jerk. The base is sturdy. It is a good choice to add to an elegant look of your house. Well-designed as to make it look attractive. The body and base is of plastic. Q: Which coil does it have Aluminum or Copper? A: It comes with copper coil. Q: Up to what distance will it deliver the air? A: It would deliver them up to around 15 feet away. The first fan was a handheld fan which was used in India about 500 BC. It was made up of bamboo stripes or other plant fiber. It could be rotated to move air. Later during the British rule, a large swinging flat fan was fixed to the ceiling and moved by the servants called as Punkahwala. Han Dynasty and Ding Huan invented a manually operated rotary fan which 7 wheels. Later in the 8th century, the Chinese applied Hydraulic power to rotate the wheels of the fan. Rotary fan became common in during Song Dynasty. When we talk about Electric fans, in between 1882 and 1886, Schuler Wheeler invented a fan that was powered by electricity. You can read the complete history of Fans on Wikipedia. The V-guard Finesta pedestal fans have a very unique feature of being operated with remote. It can be operated both manually as well as with a remote. So, if you are fitting this fan in your old parents or grandparents room, it will ease the operations for them. Not just that it also comes with the timer which enables the user to sleep peacefully with automatic control of temperature. This fan comes with 3 modes of wind selection- normal, natural and sleep. This makes the fan versatile to be used anywhere in the home or office. The black and yellow color gives it a stylish look. No wonder it is a convenient and economical solution to your summer worries. Also, it’s neither bulky nor noisy. The sleek design makes it fit anywhere in the house without occupying much space. The air delivery of this fan is minimum 65 CMM. The speed of the fan is 1350 RPM. It has remote control (also manual operations can be done). Q: What is the maximum height fan can be adjusted to? A: It can be adjusted up to 4ft. Q: At what intervals can the timer be set? A:Timer can be set at intervals of 30 mins up to 7.5 hours. 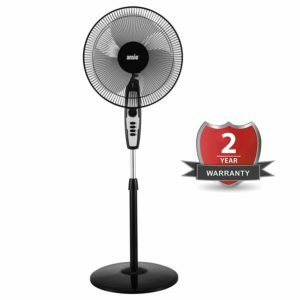 ANISO offer one of the best high-speed pedestal fans in India. With 2,300 RPM (at the highest speed) and 80-degree oscillation, ANSIO claims to provide 30% more airflow than any other normal pedestal fan. The fan comes with adjustable heights, and the fan head can be tilted up or down to adjust the cooling angles. The fan comes with a timer feature to automatically turn off the fan (up to 2 hours). Further, it has a 100% copper motor. Due to the very high speed, the fan does become a little noisy. Hence it will not be suitable in quiet or low noise environments like bedrooms. 80-degree oscillation and tilt head. Q: Does one need to assembly the fan after delivery? A: Yes, the fan needs to be assembled, but it is a very easy process, and a manual instruction guide will also be provided. Q: Does the fan heat at high speed? A: No, there are no major heating issues as it comes with overheating protection. Tower Fan vs Pedestal Fan – Which is Better? If you are confused in making a choice between the tower fans and pedestal fans, and unable to make the right choice between the two – the following tips can prove to be helpful enough. If you are worried about the space constraints, the tower fan can be a better option than the pedestal one for space constraints. The tower fan can help you fit it in any corner of the room. On the other hand, if you have a larger room, the pedestal fan may be a great alternative. The larger blades on the pedestal fans can be one of the great choices for circulating efficient air circulation in a large room. If the fan is to be used in a bedroom, noise can be one of the important considerations. Once again, the tower fan can be a little quieter than the pedestal fans. Sine the pedestal fans are made with larger blades, they tend to make a little more noise. However, that apart, the pedestal fans tend to offer you a better air circulation as compared to the tower fans. Of course, you would look for the lowest possible cost of using the fans. The fans that use the least energy can be a good choice. From that perspective, pedestal fans use half energy than that used by tower fans, thus pedestal fans become a very good choice. If you are looking for a fan that provides you with easy cleaning options, tower fan can be the ultimate choice. The blades are placed deeper inside the fan, and thus there are lesser chances of it catching rust or dirt. On the other hand, a pedestal fan needs you to disassemble for cleaning it, which is not a very difficult task. Ultimately, it should be your personal preference in choosing the right option among the pedestal fan and a tower fan. Also, please be sure that in general tower fans are more expensive than pedestal fans, thus please even consider the cost-benefit ratio. Controlled air flow is an excellent option with pedestal fans. It provides you control in any of the directions you want. Area of airflow provided by the pedestal fans is much larger. Best suited to keep up with the décor of your office. The pedestal fans are more powerful options. It may not be a good option in terms of aesthetics. It may not be a good option for constrained spaces. Powerful functionality may mean more noise. The fans are available in a wider range of price options. It can be the best option to fit in the constrained areas. Offers you an excellent versatility in terms of features. They may not be the durable options in some cases. You cannot have easy control over the direction of the air flow. How to Assemble Pedestal Fan? To begin with, lay the parts of the fan on the floor. First of all, place the pole on the base of the stand. You only need to insert the screws and connect them. On some models, the pole and the base can be moulded together. Next on, install the motor and the oscillating arm. The pole comes with the predrilled holes. You can easily screw in the motor and other elements into the pole. The next step would involve inserting the blades. In essence, the pedestal fans come with an easy to follow installation instructions. You do not need to be an expert in the electrical engineering as it just involves inserting the screws into the previously drilled holes and your fan is set up. Now,once yu have installed and started using the best selling pedestal fan in India, now comes the time for maintenance. Let’s check out some easy methods to clean the best pedestal fan in India. How to Clean Pedestal Fan? First of all, remove the cage that protects the blades. The cage may be attached to the body through the clips, or they may be screwed together. You can unsnap the clips or use a screw driver to unscrew the front grill. You can remove the back grill as well if they are removable. This will provide you with a better access to clean the blades. Before removing the blades, you need to unscrew the cap that holds the blades to the cap. Once that done, the blades can be slipped out for a better cleaning. Dust the blades with a dry cloth. If the blades have any stubborn kind of dust or dirt, they can be cleaned with damp cloth or sponge. You can use the scrubber, but make sure you are not using anything that can be too abrasive. For cleaning the corners and tough to reach positions you can use a tooth brush or similar material or even use dampened cotton swabs. Make sure that once they are cleaned, they are dried with a towel before assembling them back int the fan. These deep cleaning sessions can be taken up once every two or three months. In between these sessions, a vacuum cleaning option can be good enough to prevent the build-up of stubborn dust or dirt. Just after 2-3 months, the summer season is going to start, and it is the right time to make the decision for buying the best Pedestal Fan for your house to stay relived in the heat. 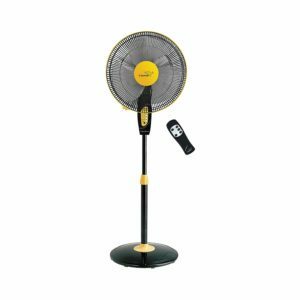 These 5 Pedestal Fans that are mentioned in the article are the best ones that you should go for. If you have got any questions, do ask in the comments! Thanks. Thank you for the well researched article. I bought Usha Maxx Air and till now it is a good purchase. Good for the price list too. Every fan mentioned here is not so expensive and can be afforded easily. These models of the fans are good for residential purposes. Portabilty makes these fans extra great. Thanks for coming by, and liking the list. Hope you find the best one for you from the list. I want to research well before buying a good pedestal fan. And this article gave me a deep insight into what criteria to use and what all to use. Thanks for the article. Glad you liked the fans list. Hope you find the best pedestal fan for you from this list. Thanks for coming by.